Dale’s Ham and Cheese Sliders are perfect for tailgating. 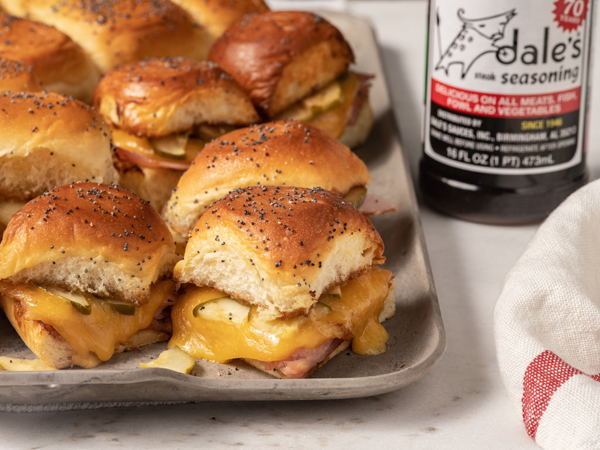 This recipe makes the tailgating prep easier and tastier.Try pairing Dale’s Ham and Cheese Sliders with Dale’s Burgers. To begin, preheat the broiler to high heat. This will be for the last step in preparing your Dale's Ham and Cheese Sliders. First, whisk together the Dale’s and mayonnaise in a small bowl. Keeping the rolls connected side-by-side, cut crosswise through the rolls to split them open. Place the rolls cut side up on a large baking sheet. This will give you room to prepare your Dale's Ham and Cheese Sliders. Next, spread the Dale’s mixture in a thin layer over the cut side of each set of rolls. Place under the broiler for 1 minute. Then reduce oven temperature to 375. Cover the bottom half of each set of rolls with 2 layers of ham, overlapping each slice by ½. Next, cover with 1 layer of cheese slices, overlapping each slice by ½. Top your sliders with 1 layer of sliced pickles. Finally, cover with the toasted top half of the rolls. Bake for 25-30 minutes, covered with foil, until the cheese and ham in the center sliders are melted and warm. Cut your Dale's Ham and Cheese Sliders and serve!